The Husky HM39 undercounter wine cooler features mixed shelving which means it is capable of storing all wine types plus all your favourite cans and soft drinks. An interior light ensures you find what you are looking for, and the integral door lock keeps the contents safe from children. At 843mm high, the wine cooler is perfect for undercounters in kitchens - however the black cabinet and stainless steel door trim will perfectly complement any home décor. 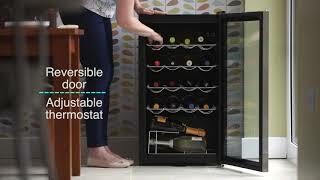 Extremely versatile drinks choice and the perfect entertaining cooling accessory. 132 kWh per annum. Based on standard test results for 24 hours. Actual energy consumption will depend on how the appliance is used and where it is located.